If you’ve talked to me in the past few months, you’ve probably learned that I am training for the Chicago Marathon. This rather bold (possibly ludacris) endeavor comes not from a lifelong love of athletics, but rather from a somewhat impulsive decision to run a half marathon this past Spring. I made the choice to train for that first race because I was going through a really rough time and I needed a goal that would keep me active and engaged in something healthy. 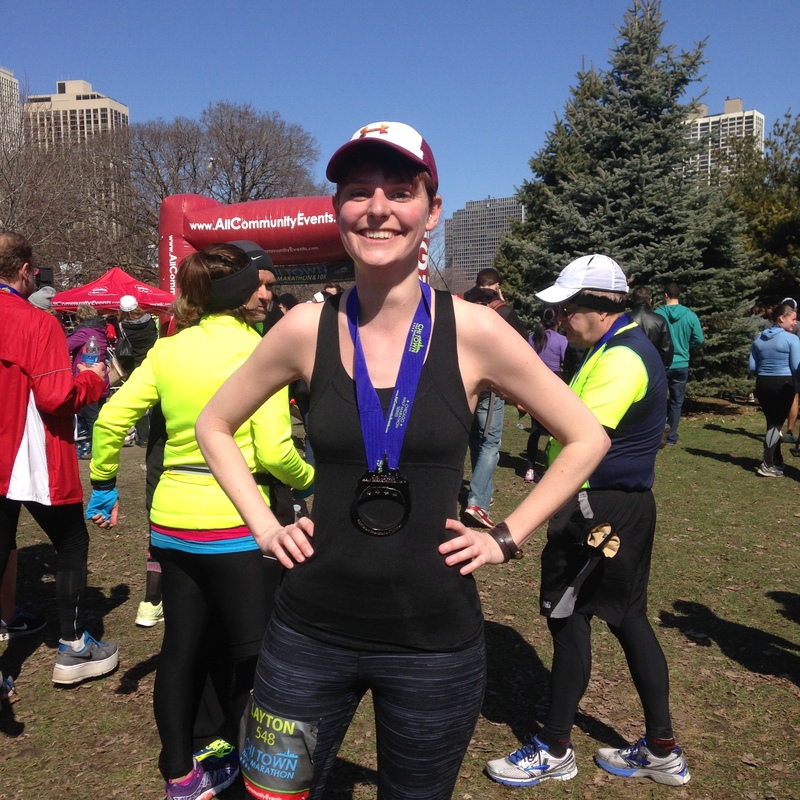 I learned so much from that first race experience (which you can read about here) and when the opportunity arose to push myself even further and run my first marathon, I decided to take the plunge. It would be tempting to make this new running hobby of mine a story about my own strength and boldness and ability, but that’s not really the truth. My running has everything to do with the support and encouragement I’ve received from other people in my life. It was other people who first helped me believe that I had the resources within myself to face challenging times with creative solutions. And other people encouraged and supported me throughout my whole training process for my first race, cheering me on even when I wanted to give up. I have been so lucky throughout my life to have people who have invested their time and energy into helping me know that I am valued and loved and capable. That profound experience propelled me first into work as a nonprofit educator and then to ministry, so that I might love and encourage others as I have been loved and encouraged. It feels so appropriate, given all of this, that my first marathon be dedicated to raising funds for Chicago Lights. Chicago Lights is the nonprofit arm of Fourth Presbyterian Church and they do incredible work that—at its core—is truly about helping people know that they are loved and valued and capable. They do this work through 6 distinct programs—the Tutoring Program, the Urban Farm, CLASS (arts programming in schools), Free Write Jail Arts & Literacy for incarcerated youth, a Summer Day program, and the Elam Davies Social Services Center. The majority of these programs focus on youth which is my own passion area. All of the crucial support that Chicago Lights provides empowers and encourages people to know that they are beloved. This is such important work, especially in a world as broken as ours. It’s certainly worth running 26.2 miles. And I hope it’s worth however much you can offer. Every dollar I raise will go directly to supporting these youth and adults who very much need a message of love. And every donor is another person in this world sending them that message. Thanks for taking the time to read. Whether or not you can donate, please spread the word. Maybe it’s just me, but these words seem epic. They sound to me like the charge that might come from a wise mentor at the beginning of a hero’s quest. I can hear them being said by Gandalf to Frodo in the Lord of the Rings. I can hear them in Yoda’s voice—perhaps in a different order, being offered to Luke Skywalker. But these words aren’t for mythic heroes on epic quests. These words are for us—to guide us in our journey of faith. And they don’t speak to us about individual destiny or glory. The worthy life they describe is a communal life bound up in the one hope of Jesus Christ even as we each live out that hope in our own callings. But let’s talk about epic heroes for a moment. When I was 11 years old, a book was published that changed the world. It was a children’s fantasy book about a boy who learns he’s a wizard and suddenly finds himself part of a hidden magical community and an epic battle between good and evil. Harry Potter was a cultural phenomenon that has become inextricably associated with the childhood and adolescence of my generation. Many of us spent our summers waiting anxiously for the midnight release of the latest book and then devouring it before the sun had even risen on another day. We lamented never receiving our own letters of acceptance to a magical boarding school. And we dreamed of what it would be like to suddenly find ourselves a hero at the center of an epic story like Harry. And in many obvious ways, Harry is at the heart of the series that bears his name. But one of the most amazing aspects of JK Rowling’s famous books is the great diversity of characters, all of whom—ultimately—have a pivotal role to play in the unfolding of the story. This is true, even and perhaps especially, for the characters that seem least likely to be significant. The most profound example of this might be Harry’s friend and classmate, Neville Longbottom. Neville is introduced early on in the first book, as a bumbling, hopelessly awkward boy who barely qualifies as a wizard. He struggles academically, magically, and socially, and for much of the series his entire role seems to be getting in the way or providing comic relief. At the end of the first book, Neville stands up to Harry and his other friends when they try to go after a powerful evil wizard on their own. This small act of courage ultimately benefits his classmates, and foreshadows that there may be more to Neville’s story than one would expect. Indeed, as the series progresses, Neville slowly begins to prove himself. In the climactic battle at the end of the series—there is a moment when all hope seems lost. In that moment, it is bumbling, hopeless Neville Longbottom who rises to the occasion and performs a crucial act that saves everyone and allows the villain to be vanquished once and for all. Neville’s moment of heroic action isn’t a singular fluke, nor is it the result of a radical transformation into someone entirely different than he was at the beginning of the series. Instead, Neville grows into himself—into his own unique qualities—through the validation of his community. Those qualities that had once seemed inhibitors to success become gifts that he alone can offer. In fact, Harry’s journey throughout the story is not one of becoming a perfect, fully capable hero who alone can save the world. Rather, he grows more and more aware of his need for the other people in his life and surrounds himself with a community of individuals who lend their own specials gift to a larger cause. I doubt I am the only person of my generation who grew up imagining herself as Harry Potter. I wanted to be the hero, the boy who lived, the chosen one—but the truth is that I probably had a lot more in common with Neville. I was—to put it simply—awkward. Socially hopeless. An absolute misfit. I didn’t feel like I belonged anywhere. The only exception was my church. My family joined the church of my childhood when I was six years old. I came to feel more at home among those people and in those hallways than I did anywhere else in the world. I sang in the children’s choir, served as an acolyte, and even got to read scripture a few times as a kid. By age eight, I was writing letters to the head pastor with suggestions of how they might improve their children’s ministry. I never had to question if I had a place in that community—I just knew that I did. When I was twelve, a good friend from church’s father committed suicide. It was my first real experience with death and I was utterly undone by it. My own dad struggled with depression and losing him was one of my greatest fears. I was overwhelmed by the knowledge of someone else’s deep pain and my own inability to make it better. I didn’t know how to talk about or process the chasm of grief within me. It was an ugly little thing. And it would have been perfectly acceptable for someone to quietly clear it away and perhaps offer me a kind word of encouragement and a hug when they saw me next. But that’s not what happened. My awkward memorial stayed put. And on Sunday morning, when the sanctuary filled with worshippers, it was still there. The time came for the children’s message and my youth pastor called all the little kids to gather on the steps of the chancel like always. And she showed them what I had made and talked about what it meant to love and care for others and what it means to know that we are loved and cared for by God. I watched it all unfold from the comfort of my family’s pew, and the impact on me was profound. I might just have been accepted and that would have meant a lot. But my church community made it clear to me in that moment and countless other times as I grew up that I had something to offer and that what I offered was good and important and valued even when it was awkward or ugly or hard. Like Neville, I came to know that I was an important part of something much bigger than myself. In my case, I learned that essential truth from my community of faith. I learned that I had a calling, that I shared it with a larger community made up of people who all had their own unique gifts to offer. I think these are words that charge us to an epic quest. What quest could be more epic than living out our faith and working toward the kindom of God? What cause more vital than seeking to understand unity in a world that seems so defined by division and conflict? Every newspaper and television screen proclaims our catastrophic brokenness. Our world is rent asunder by racism and classism, by hatred and violence, by greed and warfare. Everywhere we look, there are people and communities torn apart by the questions of what a life is worth and whether one kind of life is worth more than another. The church isn’t immune to this sort of divisive conflict either. In individual congregations, in denominations, and in the church as a whole we fight and divide ourselves over things as minor as carpet color and as significant as what justice means from Jesus’ perspective. What is the right way to believe? What is the right way to live? And what do we do with the people who are doing it “wrong?” How do we all live together? We go round and round on these questions in our churches and in our societies until we feel utterly overwhelmed. We might be tempted by our feelings of helplessness to believe that there is nowhere that we fit and nothing we can do. Or we might try to protect ourselves by only surround ourselves with people who look like us and believe like us. Our modern world of social media and biased news and segregated churches and neighborhoods encourages this culture of community of the likeminded. The early church was just as familiar with this struggle as we are today. Those Christians from different places and traditions wondered how they might come together even as they faced conflict in the world around them. They debated over who was right and who was important and what to do with those who were wrong. The author of Ephesians, though, suggests that in Jesus we find a different answer for how we ought to respond. Rather than close ourselves off to those who are different, this passage emphasizes that we are all one body in Christ and called collectively to do the work of God in the world. To surrender ourselves to division and conflict is to render the body immobile and incomplete—unable to fully live into the one hope that all of its members share. However, the unity described here in our passage for today also doesn’t define itself by likemindedness or sameness or conformity. In fact, the very essence of the body of Christ is the diversity of its members. We each are given unique gifts and called to live into them as part of the larger community. We aren’t meant to all be the same and the sort of unity we find in Christ doesn’t promote consensus and peace over justice. Rather, it is crucial that every person be able to live fully into who God creates them to be. Only then, with each individual empowered, can the body grow into Christ as God intends. My New Testament professor in seminary referred to this as “mutual indebtedness.” Mutual indebtedness is the idea that only by you fully living into who God created you to be am I able to live fully into who God created me to be. And vice versa. We are called then, to work for a church and a world where every person can become who God uniquely calls them to be through the grace of Jesus Christ. This means that the all the Nevilles of this world matter and so do the awkward, misfit children like me. The people we would rather avoid and the people that want to avoid us—are all essential not because we are secretly all alike but precisely because we are not. You and me and us and them—we all matter. Not just to God but to one another and to the community as a whole. Only together can we each fully become who God intends us to be. Unity is not easy. We need only look at the world around us to know that. In fact, nothing we might attempt on our own will create the kind of unity that God calls us to. But we are bound up together not through our own ability or intention—but through the grace of Christ. Our calling in this life is to discover that unity by celebrating the unique gifts of God in one another and becoming something greater than the sum of our parts. It is an epic quest. Many years have passed since I sat in that moonlit sanctuary with my grief and my ugly handmade memorial. Much has changed in this world and in the church of my childhood since that Sunday when my awkward grief became a message about the love of God. My first beloved community of faith has been through hard seasons where differences of belief and conviction and faith have divided people and conflict has shattered our peace. Some have left and many others have stayed. There are some from that church whom I have deeply loved and now find myself painfully separated from as we still struggle with what divides us. We are as subject to the brokenness of our imperfect world as everyone. But I know and trust that even when we seem defined by our brokenness—we still belong to each other and to God. Those people and that community helped me grow into the person God created me to be and I helped them do the same. What unites us will always be stronger than anything that might divide us. What unites us is the grace of Christ made manifest uniquely in us each. What unites us is the one hope of our calling, one Lord, one faith, one baptism, one God—who is above all and through all and in all. In all. Always. Amen.